Vitamin D is an important multi-purpose nutrient that is significant in the prevention of heart and autoimmune diseases, as well as cancer. Recent research has also likened the vitamin to a “natural antibiotic” for its role in the prevention of many common ailments. The body requires sunlight in order to properly utilize Vitamin D. According to Oregon State University research, as much as 70% of the American population is Vitamin D deficient, especially during the winter months when light exposure is limited. Sun exposure is necessary for proper metabolism of Vitamin D, which occurs in the skin. Supplements are usually suggested during the winter months. 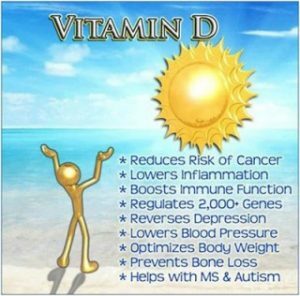 The daily recommendation for Vitamin D for adults and children are 1300 IU (units), seniors over 70 years of age at 800 IU, and infants at 400 IU. For best absorption, take Vitamin D supplements with fat containing foods such as nuts or dairy. Additionally, at least 15 to 30 minutes of direct sun exposure every day is suggested, but not always possible during the winter months. Eating Vitamin D rich foods such as salmon, tuna, fish oil, and milk, cheese, and egg yolks in moderation is also recommended. Always discuss your Vitamin D levels with your doctor.